Cody has dreams of becoming a professional football player and he's started to be noticed by the scouts. But when he is injured, all those dreams come crashing down. Depressed, he quits school and starts working real jobs. Meanwhile, his girlfriend Clea has been sent away to an expensive boarding school in Vermont by her protective father who doesn't want the girl hanging around with Cody. Cody is thinking his life can't get much worse until word reaches him that Clea has gone missing! Cody decides to go to Vermont to join the search for her and gets far more than he bargained for in the process. A suspense thriller about a football player -- not my usual cup of tea, but I'm expanding my horizons a bit! As is to be expected, a bit too much action and a bit too little thinking and emoting for my tastes, but this is a pretty good story if action is your interest. Cody is surprisingly well-drawn. Never too bright or too dumb, he does most of the right things and is a decent, sympathetic character. 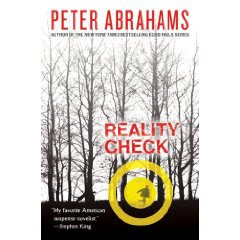 Abrahams does less well with the female characters, but he seems to have the gruff outcast male thing down well.